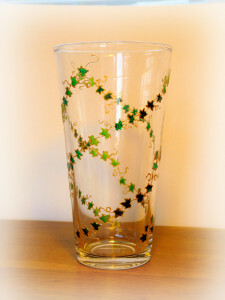 Crafty Dog Designs Cymru produce a wide range of hand-crafted artisan glassware from new and recycled glass. We also hand-draw and hand-paint drinking glasses and tableware in many different designs, which can be personalised and made to order. For examples, see Commissions page (click HERE). Remember when placing an order to click on the correct postage price – UK, or Europe/Eire or USA/Canada. 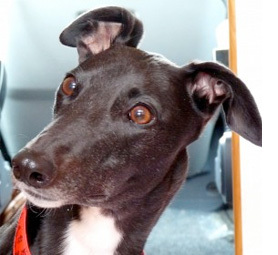 We even support rescue charities such as Galgos del Sol (see our Galgo and Podenco suncatchers). These are also available as tumblers, pint glasses, crystal tankards, wine glasses and can all be personalised with names. Fab as Wedding Favours or souvenirs. These have all been baked and are dishwasher safe. 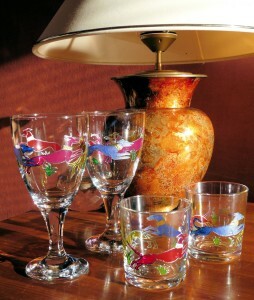 We produce a wide range of designs on gorgeous wine/beer goblets (click here). They are hand-drawn, handpainted and baked to be dishwasher proof to 40 centigrade. 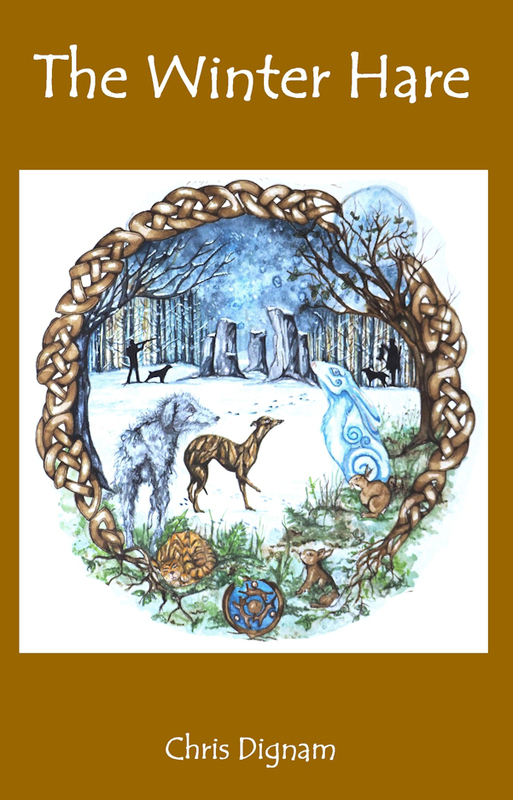 If there is a design of your own that you would particularly like, let us know. 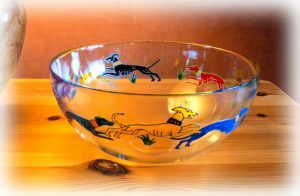 We produce a range of hand-painted fruit bowls in a number of designs (see Here). Our dancing dogs bowls are very popular, but we have also made ones with oranges, cats – if you have something you’d like us to make for you, contact us. Available in 4” and 6” glass rounds or squares, leaded and with eyelet attached, these are in a range of designs; Poppies, Primroses, Daffodils, Tudor Rose, Oruboros, Iris, Greyhounds. We also make Angel Hound 4″ suncatchers, which can be used as Christmas tree decorations, or memorial pieces, or just as a plain tree decoration. For our Galgo and Podenco designs we donate £1 from each one we sell to the rescue charity, Galgos del Sol. Bespoke images can be produced to order – contact us with the image to be used. Click here for more information. We have glass vases either handpainted or with leaded acetate. See the images here. These are one off or can be made to order if we do not have them in stock. We make a range of animal designs glassware; mostly dogs but also cats, horses, an elephant – even a kangaroo and a fish called Roger! Take a look here.